is considered to be the seventh avatar of Vishnu in Hinduism, and a king of Ayodhya in ancient Indian Puranas. His mythical life is depicted in the Ramayana. Based on Puranic genealogy, Rama is believed by Hindus to have lived around 5000 B.C.E. in the second Yuga called Treta Yuga, 2 millennia before Krishna who was born towards the end of Dwapara Yuga. 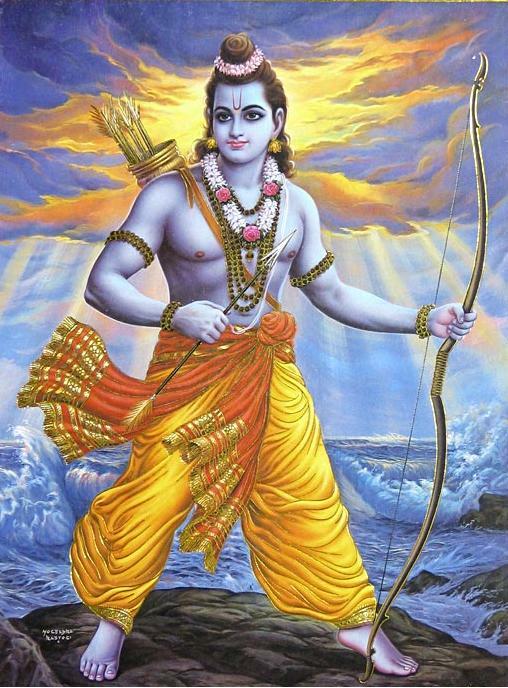 Rama is traditionally considered to have appeared in the last quarter of Treta Yuga.Born as the eldest son of Kausalya and Dasharatha, king of Ayodhya, Rama is referred to within Hinduism as Maryada Purushottama, literally the Perfect Man or Lord of Self-Control or Lord of Virtue. Rama is the husband of Sita, whom Hindus consider to be an Avatar of Lakshmi and the embodiment of perfect womanhood.